Happy Death Day 2U (film, 2019). A 2019 American science fiction slasher film with "PG-13" rating by Universal Pictures. Directed by Christopher B. Landon. Official Trailer. Happy Death Day 2U is a 2019 American science fiction slasher film directed by Christopher B. Landon. 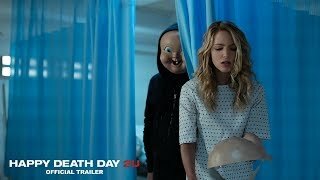 Happy Death Day 2U - Official Trailer 2 (HD). College student Ryan wakes up in his car on Tuesday, September 19. Returning to his dorm room, he walks in on his roommate Carter and Carter's girlfriend Tree. He resumes work on an experimental quantum reactor with fellow students Samar and Dre. After Bronson, the school dean, shuts down the project for triggering several power outages, Ryan is murdered by someone dressed as Babyface, and wakes up again on Tuesday the 19th. Tree explains her experience reliving Monday the 18th, and she and Carter agree to help Ryan. They learn the reactor was responsible for creating the loop. The new Babyface tracks Ryan down, but Tree unmasks him to reveal another Ryan. The second Ryan warns that the original must die for the loop to close. Terrified, Ryan activates the reactor, releasing a powerful energy pulse that knocks everyone unconscious. Tree wakes up in Carter's room on Monday the 18th, and relives her original time loop, with certain differences: Lori is not the Babyface killer, and Carter is now dating Danielle. Ryan theorizes that the reactor caused Tree to drift into another dimension. When Tree learns her mother is still alive in this new reality, she decides to stay. That night, Tree goes to the hospital to intercept serial killer John Tombs before he escapes, but is confronted by a police officer. Babyface kills the officer and Tree runs into Lori, who tells her that Babyface cannot be Tombs because she just took him in for surgery. Babyface stabs Lori, then chases Tree to the roof, where she accidentally falls to her death. She wakes at the beginning of her loop, and demands that Ryan and his team help her escape it, requiring they test dozens of algorithms. At Carter's suggestion, Tree serves as the group's recorder, killing herself at the end of each day so they can start again. Eventually, her injuries catch up with her and she faints. Waking up in the hospital, Tree steals a gun to go after Tombs, only to find Lori already dead. Babyface attacks and Tree shoots him dead. However, a second Babyface appears, forcing Tree to kill herself and Babyface. Principal photography began on May 14, 2018, in New Orleans, Louisiana. The film Happy Death Day 2U was scheduled to be released by Universal Pictures on February 13, 2019 (United States) and on February 14, 2019 (United States, United Kingdom, Germany). The duration of the film is 100 minutes. With a budget of $9 million, the film grossed over $64.3 million. Happy Death Day 2U got high rating from critics. The audience also likes the film. Audiences polled by CinemaScore gave the film an average grade of "B" on a scale ranging from A+ to F.